"Worlds' Finest - Part 1"
Epoch, the Lord of Time, is read a list of his crimes by a robotic Robin, including the recent incursion into the 853rd Century where he was arrested and incarcerated by the Superman and Batman of that era. Epoch electrocutes the robot and makes his escape eventually heading into the future Batcave where he steals a poly-alloy battlesuit. The future Batman is already there and informs him that the tech in the suit is useless without the core control. Epoch has that covered and leaves. Epoch arrives at the Justice Legion's headquarters, which is located via tesseract inside the team's meeting table. He attempts to retrieve his equipment but the future Batman is already there and the two fight. Epoch manages to escape again and reaches the future Superman's Fortress of Solitude but once again Batman is there this time with the future Superman. The battle is brief as Epoch manages to freeze the future World's Finest heroes and escapes into his Palace of Eternity located in the Phantom Zone. He takes the Palace to Earth in the early 21st century and announces that he will be taking over the planet. Suddenly the present day Superman, Batman and Robin the Teen Wonder confront Epoch expressing their objections to his hostile takeover. Story - 4: On the surface the first chapter to "Worlds' Finest" is an extended chase scene where Epoch gets to one location, steals something and then is confronted by Batman only to head off to another location to steal something else where he is confronted by Batman only to escape to yet another location where he steals another something and is confronted by Superman and Batman only to escape to another...well, you get the picture. This sort of thing could be considered repetitive and to a certain extent it was but it was also something else. I enjoyed this comic quite a bit. While the story is set in the future it had a very classic feel to it. There was a time when I didn't really care for DC ONE MILLION but over the last year or two I have found a certain fondness for that event and the time period it was released in. There is something very cool about future versions of the Justice League; what they look like, what their back story is, etc. So it was nice to see Chris Roberson taking those particular toys out of the chest to play with. The one element of the story that I was most unfamiliar with was Epoch. I can think of one story where he was the villain and I can barely remember that one. In this story he was a decent enough bad guy and he seemed a credible threat for the future versions of Batman and Superman. I also dug the way Roberson tied the Palace of Eternity with the Phantom Zone but more on that in the art section of the review. Yeah the way he managed to continuously escape from the heroes each and every time was a little too convenient but all of that was the lead up to what I consider a great cliffhanger where he is confronted by the Superman, Batman and Robin the Teen Wonder of a "few years ago". I could be much harder on this story but the simple joy that came from seeing that last page makes it very difficult to find all that much to complain about. Art - 5: The art in this issue was fantastic. Merino has a clean style and a great sense of page design. All of the characters looked good and he managed to throw in a reference to the Batman film from 1989 with the Japanese armor in the future Batcave. I also dug the two page spread of the Phantom Zone. There was a lot packed into those pages and I liked Merino's take on Phantom Girl, Mon-El (who looked fantastic) and even the newer versions of Ursa, Zod and Non. The highlight of the issue, though, was that final page. Superman, Batman and the classic teen Robin looked great and went a long way to making this issue work for me. 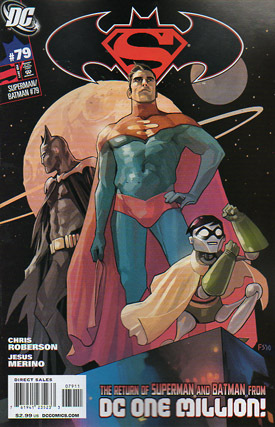 Cover Art - 4: Batman and Superman look fine on this cover. I am not a big fan of the ringed planet in the background but the robotic Robin looking like he's saying, "Put 'em up! Put 'em up!" made up for that.